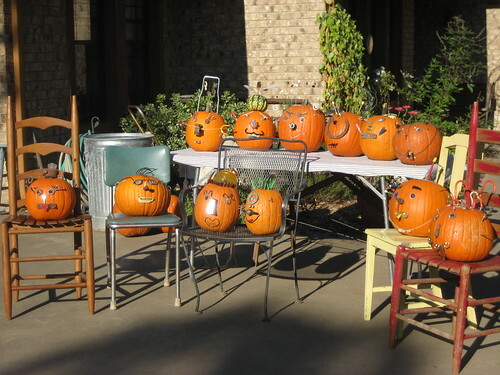 The 4th Annual Pumpkinfest was at my place this past weekend. Good times in Poetry! This event included the making of Junk Pumpkins, a Scavenger Hunt, roasting hotdogs and marshmallows, and reading ghost stories by the campfire at my pond. Fun! There was a good turn out of friends and family. Here is my very own mother's junk pumpkin. Here is a group shot. As always, click on the picture to see better. 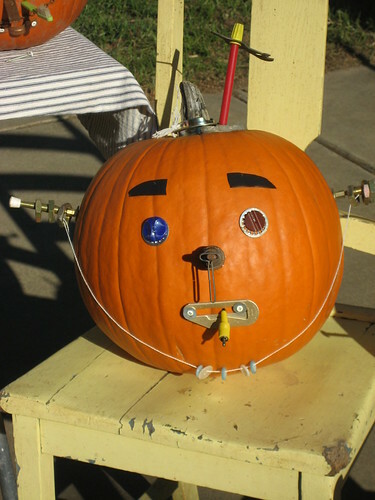 Have you ever made a Junk Pumpkin? I collect junk throughout the year. Hardware, wire, nails, screws, buttons, random junk. I put everything out on the work tables and then it gets really, really quiet as everyone begins creating. I bet you could go through your junk drawer right now and find enough "junk" to give your pumpkin personality. Here is my sister's junk pumpkin. It's a double decker. If you'd like to see all the pictures from the party, go here. And here is last year's Junk Pumpkin post with more fun creations. Perfect for a true junker's Halloween, Mindy. Brilliant! 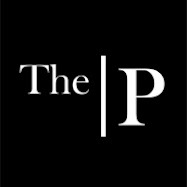 These are awesome, what a fun party, and a great idea! Good tradition to start for fall! 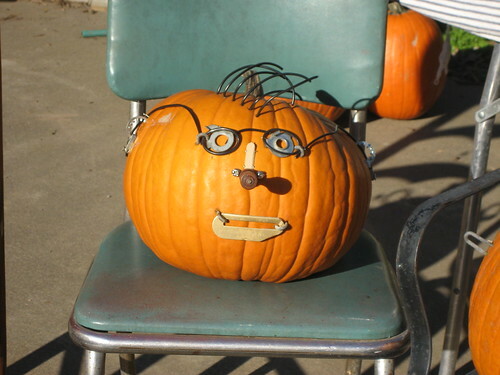 Ya know, I never have made a junk pumpkin, but you just gave me a fab idea for my booth. Don't tell David, but I think I like his pumpkin best. It has to be the glasses. Cuteness! What a great idea, Mindy! I have to do this! I love your sister's pumpkin...too cute! Well, of course you do, Anne! lol Thank you! 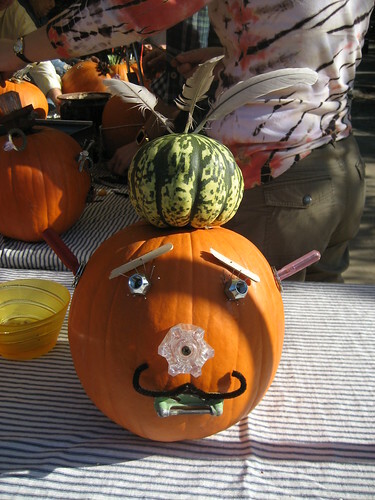 We had great participation with the junk pumpkin decorating this year and they were all so creative! Everyone had a great time. Perfect weather, a great turnout of family and friends, lots of fun things to do, it just doesn't get any better! It looks like so much fun. Everyone should have to hold their pumpkin in front of their faces for photos...even David! Looks like fun, I love the pumpkins. What a GREAT idea! I am going to start looking for stuff for mine! What a great idea! That looks like so much fun. I'm glad you enjoyed the weekend. Halloween in the true juker's style! What a fun idea. Did you have a contest, too? Sounds like a great party!! These are tooooo cute! What a wonderful idea and a great party idea!!! I can't wait to see what "Junk Turkey and Junk Santa" will look like! 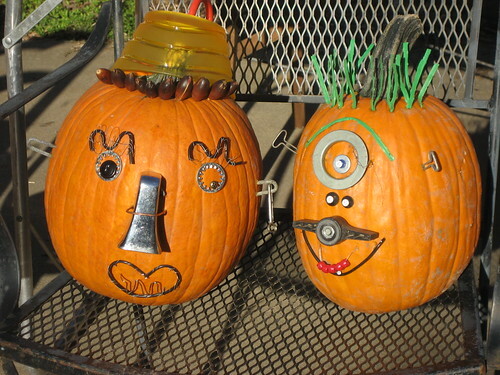 You'll have to go to my blog and see my junk pumpkin post...they are so fun to make! Love all the junky pumpkins in your post!